ESS Shakuhachi Forum :: Playing shakuhachi as a prayer? Playing shakuhachi as a prayer? Posted: 2011-10-20, 12:50 Post subject: Playing shakuhachi as a prayer? I was sitting an pondering about the motivation to play shakuhachi and why people take up shakuhachi. Thinking through the possibilities and motivations in the spiritual direction, I have heard from players over the years when talking to them about their shakuhachi practice, I began to wonder how many people actually use the shakuhachi as a prayer. Probably people play shakuhachi as a prayer some times and other times not... my guess of course. But are there also people where the main aspect of shakuhachi playing is prayer? I'd love to hear from both people using it as prayer some times and others where the prayer aspect is of more importance. Posted: 2011-10-20, 14:47 Post subject: Playing shakuhachi as a prayer? I definitely use in the aspect of "prayer" fairly often, though certainly not only. Have also done as you said after a death or disaster, but just as general thanks-giving as well.... this summer in Karuizawa I many days played honkyoku before Mount Asama or a waterfall that has connection to Fudo Myo-o called Sengataki (both feel very sacred to me) as a prayer, a general prayer.... in the sense of 手向け　offering to the kami rather than anything with death. 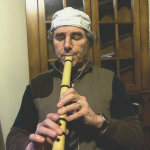 Posted: 2011-10-20, 20:14 Post subject: Playing shakuhachi as a prayer? Could you help me to define what you mean by prayer? Posted: 2011-10-20, 20:17 Post subject: Playing shakuhachi as a prayer? I would say that at least half of the time I play prayerfully. Prayer is also a giving of thanks. So often I am transported beyond myself when I am melodically improvising that I just let whatever notes flow into the moment without thought. Like many of us who play shakuhachi, we are goofballs in that we play outside whether in the rain or sun or wind or cold. I feel connected to the beauty of the natural world all around me. I play with the singing of the birds. I play RO and the spiders nearby dance in their webs. Many times when I walk I see familiar trees that I have passed by for years that may be sick and my heart goes out to it, and as is the way of many property owners it's bad curb appeal to have a sick tree so often times it is cut down instead of treated. I prayerfully play over the stump. Oh yes I do play prayerfully in the case of disaters and misfortunes and illness of my fellows, but I try my best to not dwell on the bad and see the blessings all around and play from my heart. Posted: 2011-10-20, 22:10 Post subject: Playing shakuhachi as a prayer? prayer would be more on the lines of sutra chant, incense or Tea offering, bowing before a shrine, presenting an offering to an "other" (or all beings) expressing thanks (as Christopher Nickels said) or wish or whatnot. to me it would be more purposeful than what we might call "suizen" like chanting sutra is more purposeful than zazen. of course practicing something technical like passages in a song one is trying to learn would be yet another category, but i wouldn't call that "playing" as such. Posted: 2011-10-20, 22:36 Post subject: Playing shakuhachi as a prayer? I live in a mostly evangelical Christian environment and prayer here means something very different (and in my mostly catholic childhood), there is typically a god at the other end receiving the prayer/transmission and one is asking for intercession either by gift, celestial barter (I'll never drink that much again if...), or of thanks. I hear it in other contexts and usually mind mind becomes paralyzed. This helps. Posted: 2011-10-21, 01:21 Post subject: Playing shakuhachi as a prayer? I had forgotten about prayer. I like to listen to Mahalia Jackson sing 'I am falling and rising on my way'; it's a kind of ritual. Performing for my teacher is like that. Having more than one teacher. Perhaps I could listen a little less to Mahalia; I had an upheaval last time I performed for my teachers and fellow students. Riley said the shakuhachi is a versatile instrument. I am wondering is the jinashi flute suitable to play honkyoku? Posted: 2011-10-21, 02:50 Post subject: Playing shakuhachi as a prayer? I play to connect. It doesn't matter whether I'm trying to connect to an audience (human or otherwise); the intention of a composer; a tree, a rock, an ocean or the universe; or most often, myself. It's all about connecting. That's why if I don't play everyday, I begin to feel out-of-sorts...disconnected. Posted: 2011-10-21, 02:54 Post subject: Playing shakuhachi as a prayer? Hmmm... Since I have little structure encoded within my cognitive thinking, meaning I have no teacher and am without any traditional schooling, I can realistically ONLY use the shakuhachi as a vehicle for prayer and reflection. A veritable meditation of musical parameters and the journey of self-discovery which such a simple tube of lovely bamboo can teach one. It doesn't seem proper to rock-out on a majestic flute, such as the shakuhachi, so I respectfully refrain from doing so. Sure, I can imitate recorded pieces of traditional shakuhachi music... but it's kinda artificial without the actual knowledge of such a refined musical language. If I lean towards my prior training, I find it has a jazzy and even a haunting bluesy voice. Yes, it feels natural to me... but I know that this is only part of what is possible. When I abandon myself to the instrument in-hand, I am stunned by the practically infinite sonic possibilities which can emanate from the sheer emptiness and depths of silence, which the un-played flute holds in secretive mystery. The shakuhachi patiently awaits it's freedom of musical flight, in partnership with the very human being filling it with breath. Thus, musical exploration, prayer and even complex mathematics are all potential forms of it's near limitless expression. Or is it truly, the player himslef/herself who give life to the shakuhachi's traditional voice and purely Japanese sound? So too, the prayer is offered by the player, towards all of life and living beings. For me it is really more a meditation, than a prayer. Playing this sublime bamboo instrument absorbs me and takes me away from any subjective sensibility and sweeps me into the formless Tao. It locks me so much into my breath that I sometimes feel myself being released... or even erased, if you will? I don't mean to come off as all quasi-mystical, New Age flu-flu... or anything so transparently pretentious. But just blowing Ro when I am in a clear and centered state of mind... I am undone for a period of some timelessness. So, from my own small experience, it's sort of like a long wordless chant. Is this akin to prayer? Prayer seems so much more mindful and intentional. Prayer implies deep compassion and a state of sincere reverence. Honestly, I probably haven't gotten to the point whereby I can truly offer a proper prayer, one which mirrors the austere spirit of the old Komuso. I certainly do aspire to, though. I just don't know the language yet. And even when I THINK I do... it will eventually have to be tossed into The Great Void... along with all of my other personal illusions, eh? Posted: 2011-10-21, 07:01 Post subject: Playing shakuhachi as a prayer? Mahalia is a great light of the gospel, and if you are lightened by her music, that light shines in your playing. Posted: 2011-10-21, 13:41 Post subject: Playing shakuhachi as a prayer? Interesting aspects of prayer and playing! Michael, I think prayer is a very personal thing and therefore can be used very differently. That is also why it is so interesting. Do you think playing shakuhachi can be used in this kind of Christian prayer you mention here? I loved reading about Cristopher's way of praying also to the positive aspects in this world. Glenn's way of dividing the playing into different purposes is also great to hear about. Fiona, indeed your teacher is right - I think. The shakuhachi is very versatile. Are you asking if I think jinashi shakuhachi is suited for honkyoku? Honkyoku were composed and played on jinashi shakuhachi before the modern jinuri shakuhachi were made. The jinashi shakuhachi during the Edo period were naturally somewhat different than the jinashi shakuhachi created today. But the ones today can surely play honkyoku. Just make sure to get hold of a decent jinashi shakuhachi. Thanks guys for your answers... please do come with more! Posted: 2011-10-21, 19:42 Post subject: Playing shakuhachi as a prayer? Hi Kiku, I'm sorry. I guess that my post mislead. I wasn't addressing your original inquiry about prayer and playing shakuhachi, but rather stating what typically happens to me when I play shakuhachi. I'm a heathen. I don't formally pray through the shakuhachi. But connection does happen and I suppose that has more to do with the centering aspect of playing than anything else. Wishing people well is my normal way and as such I don't take special measures to do that. Naturally, when I play for an audience, I wish that they experience enjoyment, interest, emotional/intellectual/spiritual movement, inquisitiveness, peace, etc. But I've never become one with anybody or anything by playing the shakuhachi as far as I know. None of that lessens the importance of playing the shakuhachi to me though. In fact, I try to imagine at times what it might have been like to have a Spiritual relationship with playing the shakuhachi and I'm left with the answer for myself that it can only be another world. That statement will probably be read with raised eyebrows though and as it should. But it can be more easily understood by asking the question: Does the shakuhachi possess some inherent quality that connects it to a spiritual practice other than the one that we all exist in every day of our lives? My answer to that is no. But I think that an individual person's intent does. And by that, any tool, any place, any season will suffice to convey that intent. I often choose the shakuhachi. Posted: 2011-10-21, 20:49 Post subject: Playing shakuhachi as a prayer? I suppose it's very hard to get out of the Christian concept when speaking of prayer. In any etymological source I consulted the meaning is always about "obtaining" , "begging", "requesting", something, from some outside source called 'God". I conceive of Life as an all pervading Intelligence, and therefore "God" is in every cell of my body and in absolutely everything, from the shakuhachi to the tree to the child to the car... it's all just dancing molecules taking different shapes and forms. In Hinduism it's called "Lila" or the Play of the Divine. In that context, for me, prayer is simply plugging into that Oneness in a state of Gratitude and Service, whether it's done through meditation, flute playing, taking the kids to school, cooking a meal, or cleaning the toilet. On a relative level, though, I admit some means seem more "conducive" than others, and Shakuhachi is definitely my favorite "line" to "headquarters", but the Drum can take me there too. I fully agree with Jeff that the key element is intention, and from that perspective my commitment is that every time I blow on the Shakuhachi, it is a Prayer, and that does not change in performance. Posted: 2011-10-21, 23:11 Post subject: Playing shakuhachi as a prayer? I don't think it can be considered prayer, but occasionally and inadvertently I start to think I'm communicating with an unseen presence while playing. I usually stop myself from thinking that way and go back to focusing on the tone, partly because it seems like it's getting a little to close too insanity and partly because that's where the notions came from in the first place. Posted: 2011-10-21, 23:59 Post subject: Playing shakuhachi as a prayer? I play string instruments professionally and the guitar is capable of a lot of expression in bending the notes as well as nuances. It’s different from lets say the banjo but either you strum it (frailing and rapping techniques) pluck it or in the case of Scruggs style banjo, it’s mostly rolling arpeggios. Not as expressive as lead guitar. I tried Irish flutes and recorders as well as the regular transverse flutes, and they are expressive but not as wonderfully colorful and captivating as the shakuhachi. I am also a singer and the shakuhachi is capable of producing almost human vocal sound like the note, “U” for example. Also vibrato on the shakuhachi is so rich and modulated like the human voice. But you can also produce many other sounds on it. I guess what I’m trying to say is that I feel that the shakuhachi pulls so much from within me, and so it's an ideal conduit for my soul to express itself without words. 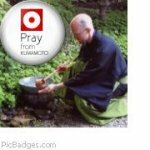 Posted: Today at 05:25 Post subject: Playing shakuhachi as a prayer?